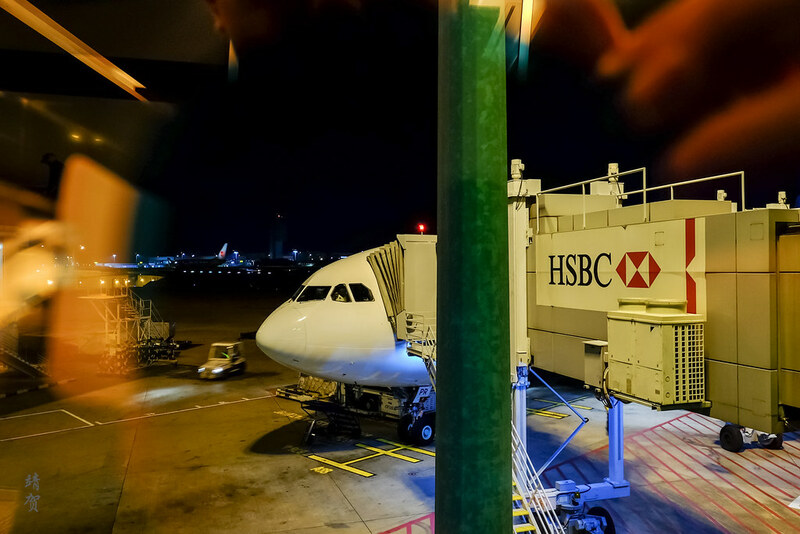 After disembarking from my Swiss flight, I head to the transfer counter and waited a while over there. The reason was that the only transfer staff manning the Garuda counters was off on a break and I wanted to add my Sky Team number to the reservation for earning status miles and to obtain new boarding passes. 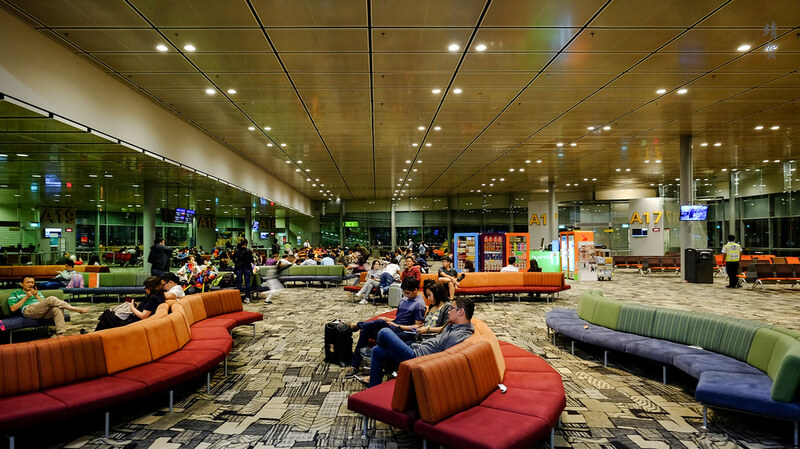 Even though I was connecting from Swiss Business to Garuda Indonesia Business, I was only allowed me to use the lesser Dnata lounge in Terminal 3 as I was not granted entry to Singapore Airlines’ Silver Kris Lounge. I had always assumed arriving from a Star Alliance flight would have allowed me entry. This is useful to keep in mind as passengers booking on Swiss does have the option to fly the connecting flight with Singapore Airlines, though in my case, Garuda Indonesia was the only remaining option. I have reviewed the Dnata lounge in Terminal 3 before and would not write about it again. I just popped into the lounge to use the lavatories and get some water since I was not particularly hungry. 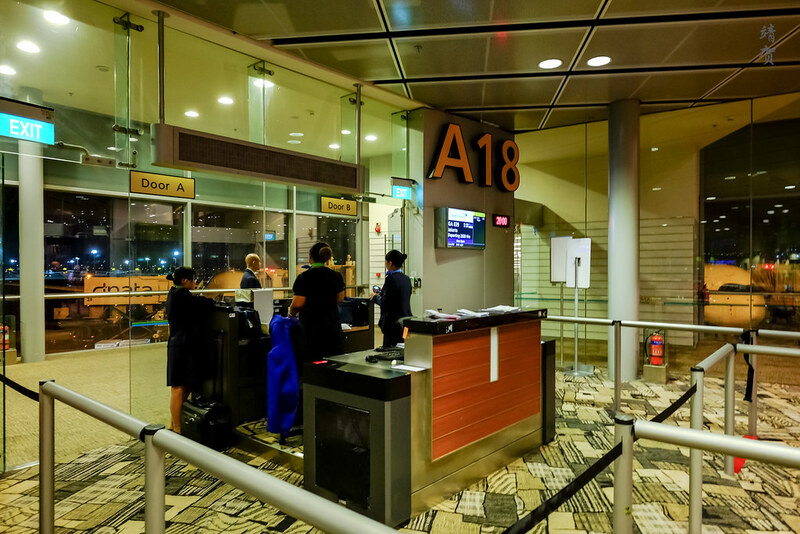 After the short lounge visit, I proceed to the gates since Garuda Indonesia tends to use one of the further gates that necessitated taking the monorail within the terminal. With security at the gates, passengers also need to spare more time to get to the gates before boarding. As it turns out, boarding was called only at around 2010, way later than what was supposed to be at 1950. This marks for a bad first impression to the flight. Though as a frequent Garuda Indonesia passenger, I have grown to accept the tardiness of the airline. They are definitely not like the Swiss for sure. This flight is the second to last flight of the day to Jakarta for this short route and is one of them that is operated by the larger Airbus A330 with most flights between Singapore and Jakarta being operated by a 737-800. 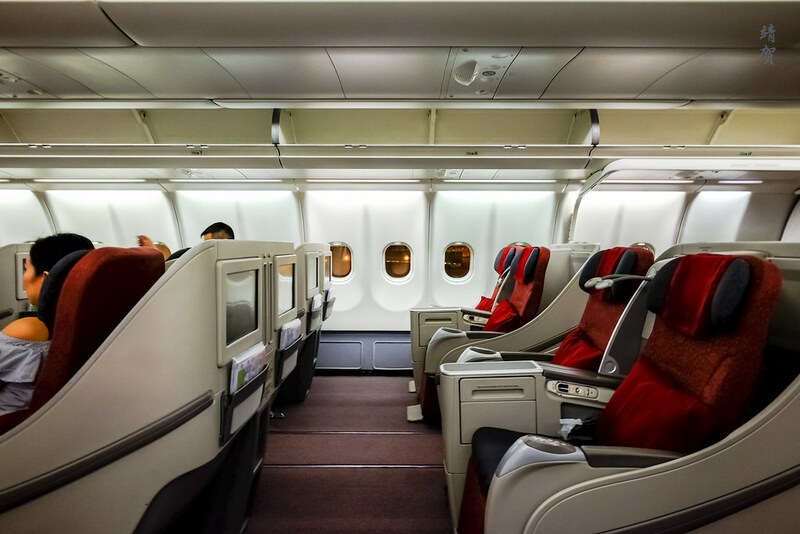 Garuda Indonesia has a couple of different cabin configurations for their A330s and since my flights with them are rarely on the A330s, this is a chance to try out their Business class. 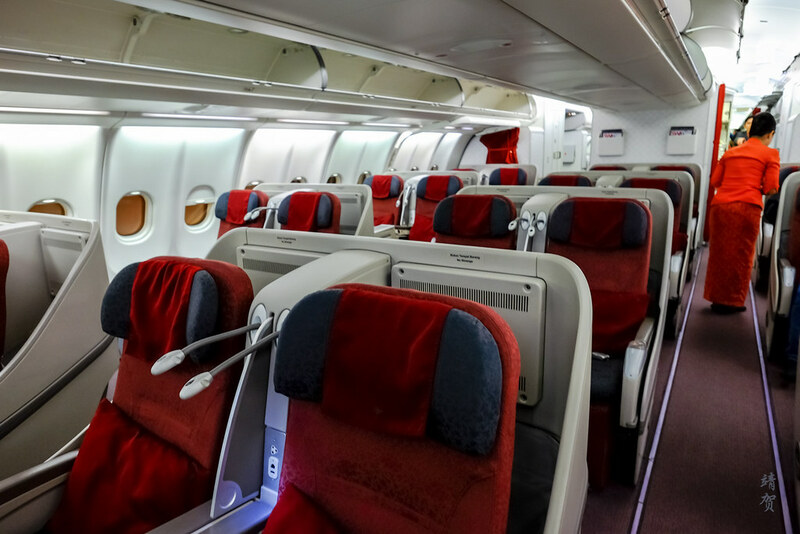 Onboard the seats are arranged in a 2-2-2 configuration with plenty of space between the rows. 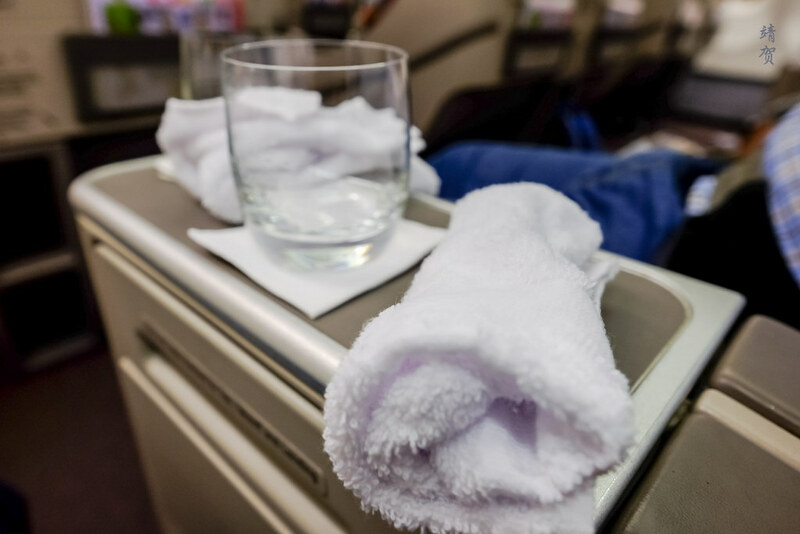 As I got seated on my seat somewhere in the middle section of the cabin, a pre-departure beverage of juice, or water was offered. A long while later, a semi hot towel was distributed but it was semi moist and seems to have been out a while. Definitely a subpar welcome for sure, since the cabin itself felt old. Magazines and newspapers were brought around the cabin which was starting to fill up and while I picked a window seat, there was a seat mate settling next to me. In front of the seat there was a monitor of a respectable size with a magazine pocket below it. Thought there seems to be a compartment to hold the reading materials in the center as well below the coat hooks. The placement of the magazine holder below the monitor was distracting to me and did clutter the cabin somewhat. The Business Class seats here are more or less similar to regional angled flat configurations seen in other Asian airlines. 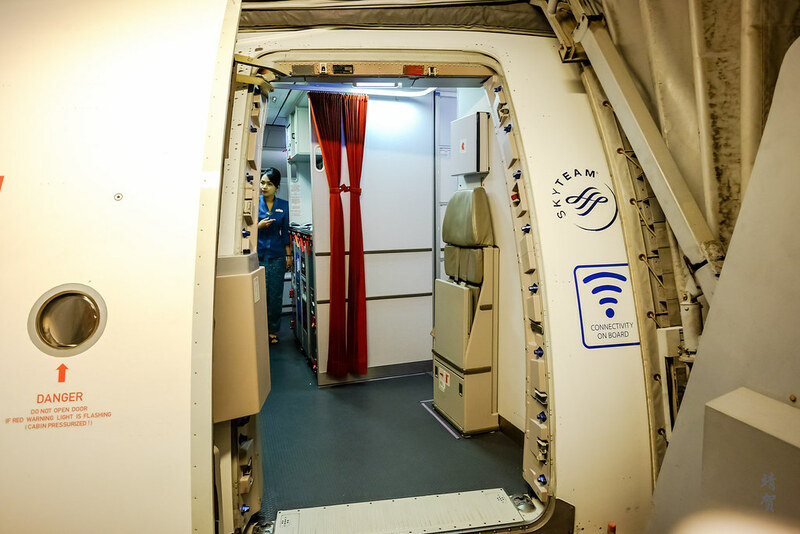 While the cabin felt spacious, it was a bit plain and does not really reflect the airline’s branding. 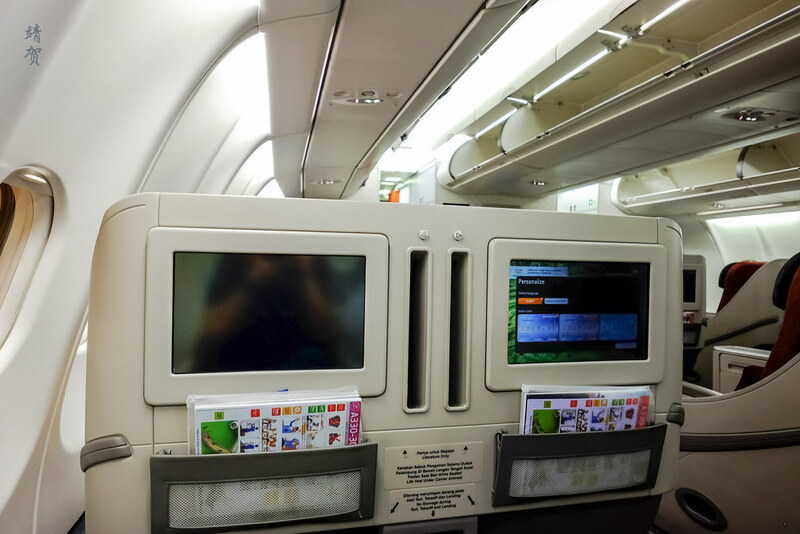 Plenty of space between the seats means there was a nice legroom but the inflight monitor does become somewhat smaller in size and resolution. 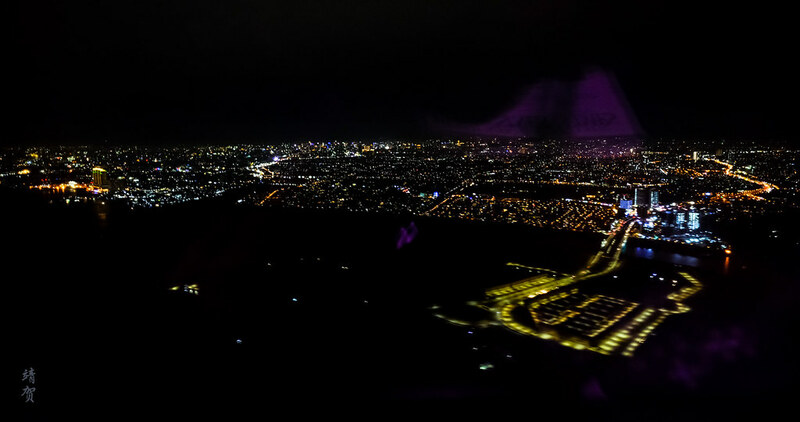 After the boarding was completed, there was a relatively quick ride over to the runway with not much of a queue for take-off during this time in Changi. 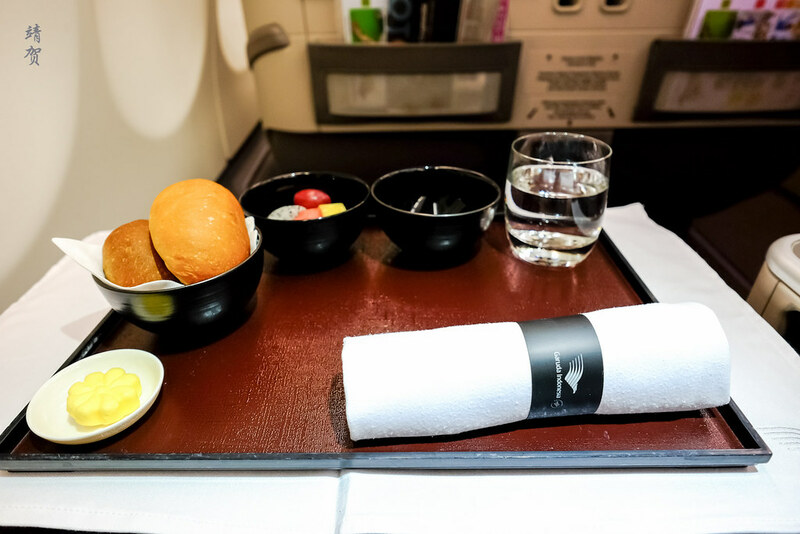 Once we were in cruising altitude, the crew started to serve the inflight meal since this is to be a short flight with a duration of less than 2 hours. A meal tray with fruit plate and bread was served first and a glass of water was included here. 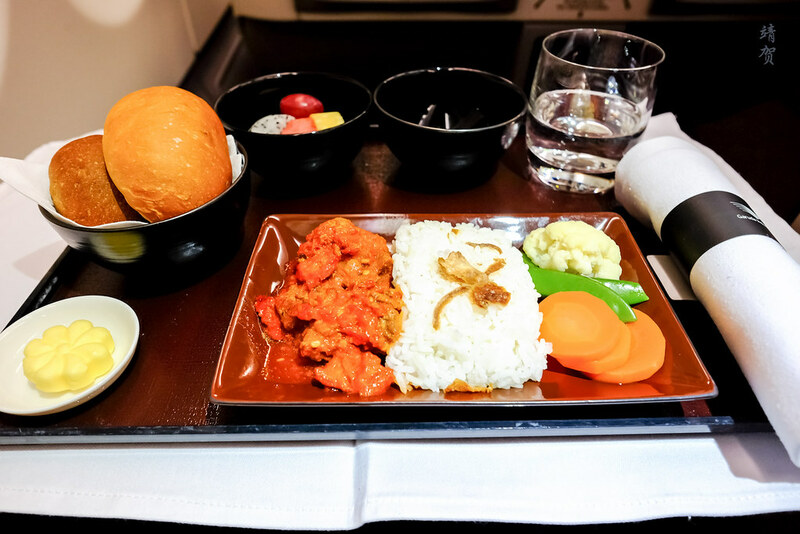 After passengers are done with their appetizers, the lead stewardess came around with the meal choices which was chicken noodles, pasta or spicy beef with rice. 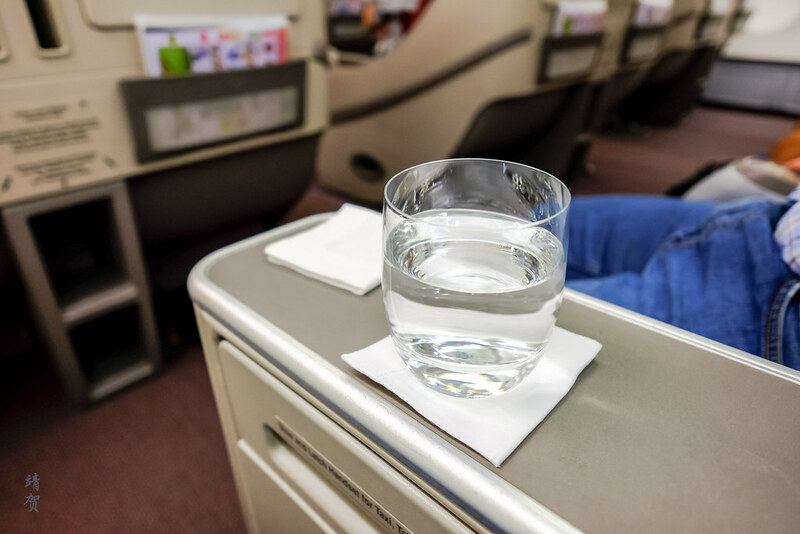 No menu was available for this short flight and from what I reckon, most of the beverage choices seems to be similar to Economy class and I just stuck with water. However I have to note that the beef dish was very tasty and I finished it with the rice that came with it. 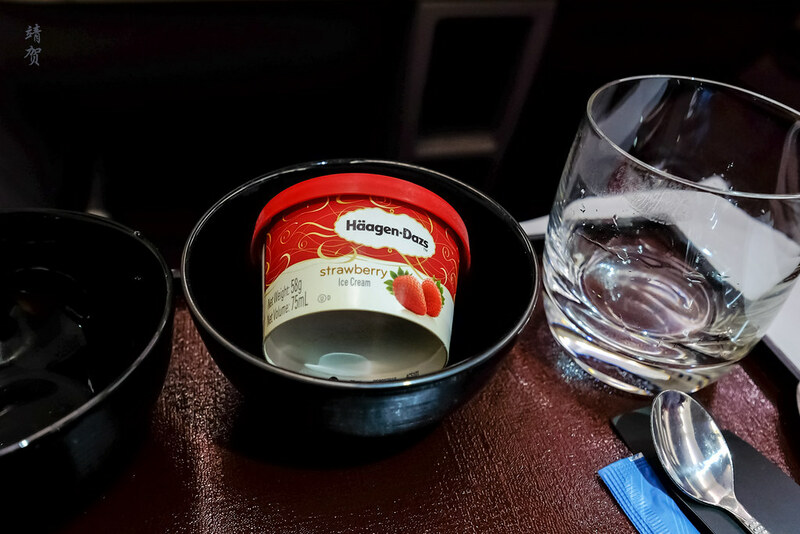 Dessert was a choice of vanilla or strawberry ice cream by Haagen Dazs. Tea and coffee was offered as the crew went around with creamer and sugar as well. The whole presentation of the meal was definitely nice and the airline does strive to add in some premium brands here and there. After the meal service, I head to the lavatory to freshen up. 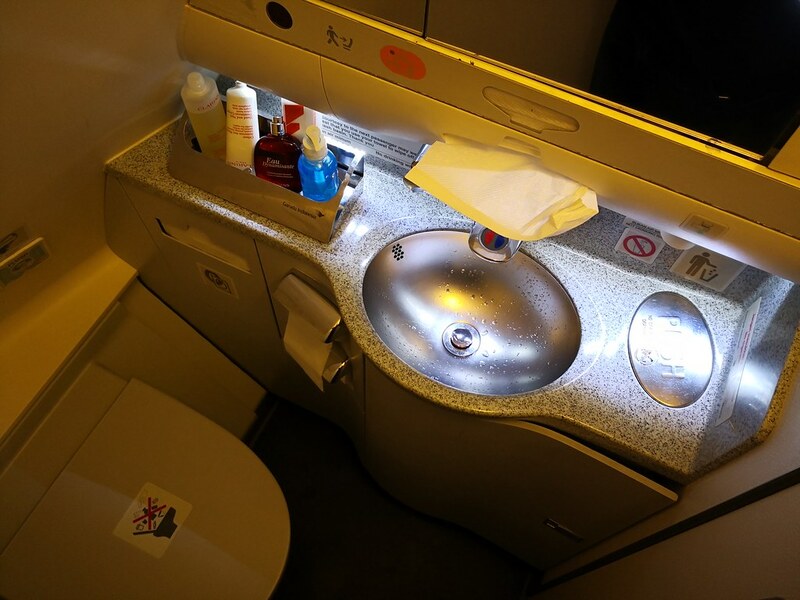 Onboard the Business class lavatory in the front of the plane, the interior is basic and small as in every A330. 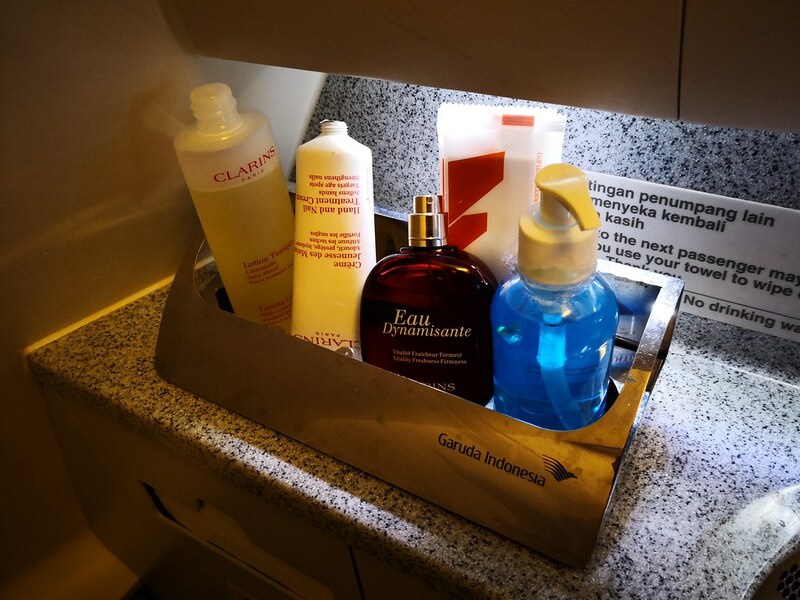 However there was nicer amenities such as a toner and hand lotion from Clarins along with eau de toilette and wet wipes. 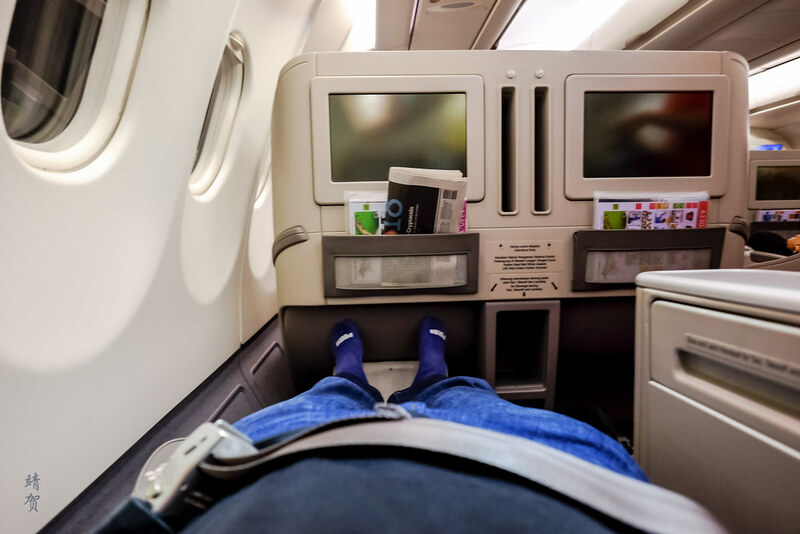 Back in my seat, I just reclined my seat to the angled flat mode to get more rest since this was the continuation of a long-haul flight from Europe and I was really tired by this point. This was definitely where the seat and cabin worked in my favour. Even with a seat mate, I still found this spacious configuration nice for a rest. All too soon, the plane started its descent. 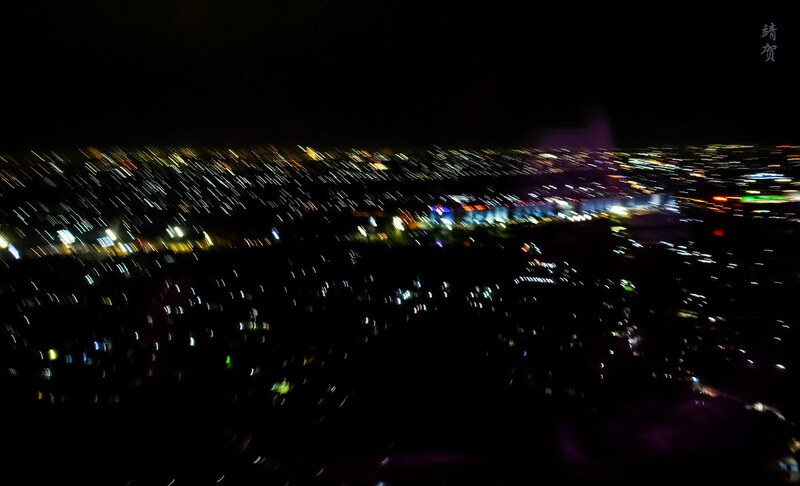 Though, the pilot came online to inform us we entered a holding pattern as there was heavy traffic in Jakarta that night, while indicating an estimated arrival of 21:30 pm. That essentially meant a delayed arrival which is attributed to the heavy traffic at the arrival airport and late departure. Do note that Garuda Indonesia is not exactly famed for their timeliness, especially with the crowded state of Jakarta’s main international airport. As we landed, the flight did dock with a jet-bridge, though I have taken this same flight before and had to take the bus to the terminal. Thus even with the new Terminal 3, there are still inadequate parking spaces for planes here. And the worst part was I had to wait for about 45 minutes for all the luggage to come out before being able to report that my checked luggage did not actually make it for the final leg. My guess is that the shorter connection time from my Swiss to Garuda Indonesia flight meant there was just not enough time to load the luggage. Aside from the missing luggage that I was reunited with a day later, the rest of this flight is fairly uneventful. With the state of the Business class cabin being a bit worn, I would not exactly say Garuda Indonesia is competitive. 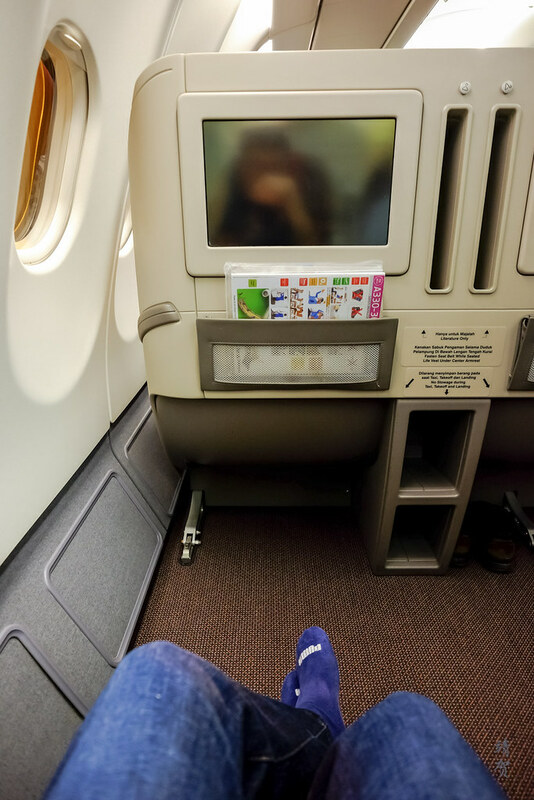 Garuda Indonesia might have strived to provide a better experience for Business Class passengers but honestly I think they still fall somewhat short. And since their prices are close to Singapore Airlines for Business class on this route, I would say Singapore Airlines definitely has them beat given that sometimes the planes on Singapore Airlines are better and I have had fantastic service with Singapore Airlines that places more confidence flying with SQ.